SHR stands for Super Hair Reduction and is the latest breakthrough innovation in IPL permanent hair reduction. When compared to traditional IPL hair reduction treatments, SHR is faster, easier and best of all - PAIN FREE! Constant waxing and plucking doesn't have to be part of your schedule anymore. SHR provides exceptional hair removal through non-invasive light technology so you can spend more time enjoying life! Usually a course of 6-10 treatments is required to achieve optimal results, but once you've completed your treatment cycle you can look forward to a lifetime of smooth skin with only the occassional maintenance treatment. Compare that to the cost and hassle of a lifetime of waxing! SHR emits powerful wavelengths directly into the hair follicle which disrupts the hair follicle’s growth. 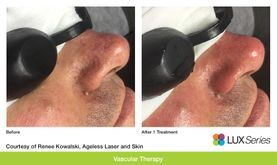 The device treats a much larger area of skin per light pulse than laser treatment making it faster and more cost effective than laser hair removal. The rapid treatment times and superior comfort factor both make SHR a leading choice when seeking permanent and hassle-free hair reduction solutions. In addition, SHR offers a great way to save on the ongoing cost and time spent on waxing, shaving and depilatory creams. SHR excels in rapid and painless hair reduction from larger areas. The SHR device comes with standard IPL to remove hair from more difficult to access treatment areas (such as the upper lip, chin or toes]. 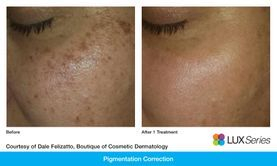 Whether born with them or acquired over the course of a lifetime, virtually everyone has one or more sun spots, freckles or skin discolouration they’d love to get rid of! 4 – 6 treatments spaced 4 weeks apart are required for optimal results. Treatments areas such as backs of hands, forearms, décolletage and face will respond well. Spider veins, broken capillaries, red spots and rosacea can all be reduced and removed to offer clients an even, more uniform complexion. Estimates indicate that unsightly veins are a common problem for more than 60% of the adult population! Our trained clinicians can offer treatments which will reduce facial blemishes such as red flushing and red spots found on cheeks and around the nose with minimal downtime or risk. A treatment cycle of 4 – 6 treatments spaced every fortnight is usually required to reach your best possible outcome. 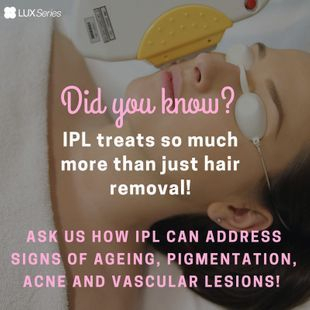 Our trained clinicians are now able to offer IPL based acne management programs for their clients. 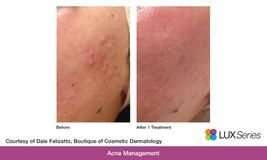 These unique treatments are designed to specifically slow the overall production of oil that leads to acne, thus dramatically reducing the chance of spots and minimising the appearance of pores in general. Results will vary, but most people will see a significant improvement in skin condition. Initially treatments will be scheduled twice a week (depending on severity) for the first 2-4 weeks then weekly for 6-8 weeks. Maintenance will then be required every 3/4 months. There may be some mild heat and redness in areas that have been treated following SHR/IPL. Soothing any redness and sensitivity with Skinstitut Laser Aid will continue to draw heat out of the skin and keep the area cool and hydrated. 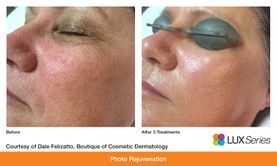 Laser Aid can be applied liberally for 3-5 days or until the skin has returned to its pre-treatment state. 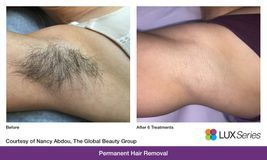 Avoid shaving, waxing or plucking hair, exfoliation, excessive sweating, swimming or saunas, very hot showers and tight restrictive clothing for 24 hours post treatment. It is advised to avoid exposing the area to direct sunlight after your treatment and always use the Skinstitut Age Defence 50+ to protect the skin and maintain results. Skinstitut Glycolic scrub 14% is recommended to use 5 days post treatment to ensure the hair is encouraged to shed from the follicle, aid in the treatment of ingrown hairs and allowing an increase in benefits from better absorption of the light.